Using the Remote Auction House. You reach for your Iphone charging on your bedside table – I wonder if my Auctions sold? you reach for your Iphone – I wonder if Glacial Salmon are cheap by the stack right now? Ok I’ll be honest – none of the above has happened in RL. but it could! 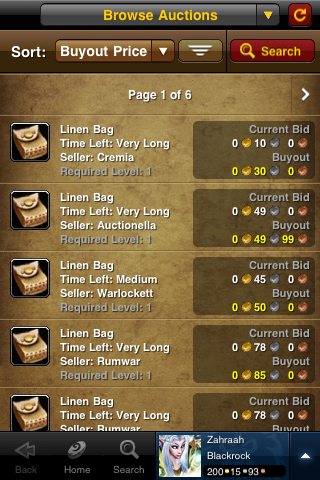 I updated my WOW Armory app today and saw the Auction house box – and for the sake of curiosity I clicked on it, wanting to see. I ran in to several problems when it came to posting an auction. After logging in with my Battle Net details – I realised that my Banking Alt is level 1 – much like most banking alts are, so of course armory doesn’t see them, so Remote AH couldn’t look in her bags, which is where all the stuff I intend to sell, but not posted is. 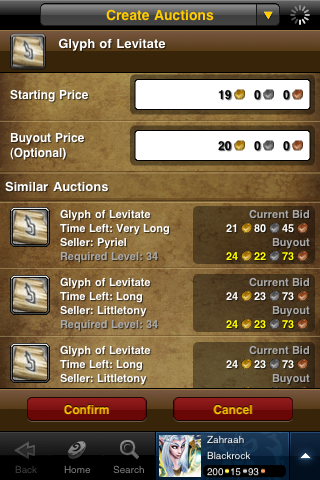 The other stuff of mine worth selling was in my guild bank – and not accesible. It only lets you access your own bank. So I was left with what ever spare stuff in mains bank that I didn’t need to play with. I scrolled through, and found a glyph. So after Selecting the Gylph, and noticing that if you scroll down the page it tells you what other Auctions are similar to give you so you can work out what price you want to make it. And then went to confirm. Where it asked me to Log in again, and my Authenticator number. I don’t mind having to type my password again for security reasons, but If I was posting more then one Auction it would annoy me. I do understand from a security point though the need. The Request for the Authenticator annoyed me the worst. No I lie it’s worse. It just made having a remote Auction house useless to me. My Authenticator does not leave my desk. It means I should not lose it. It even has a little plastic hook on the side of my 22 inch monitor where it dongles. If I changed to a Iphone App Authenticator then I still need to leave the Wow armory app, get the number from a 2nd Application and then complete the auction. Because I did not get past that point, I don’t know if it will ask for my password, and my code for each auction. In addition, When I was Playing with the remote AH feature on my phone ( was syncing to get the screenies off it. I tried to log into my Wow account on my PC, and got an error message. You can’t be in your Wow game, and the remote AH at the same time. So why the Remote AH Does not work for me. I have to level a bank alt to use it , or change my bank alt. I have to take my Authenticator with me to use. It looks like I will need to confirm my Auctions with passwords / authenticators. And a note on the Auction house remote access and its impact on extending my game play to that extent.. I have an iphone – that is distracting enough, with 8 pages of apps and a 3g connection *hums “Theres a zombie on your lawn….. ” I already fiddle with my iphone on the train, on the street, at work, at the pub, at my mums for dinner. I don’t want to feel the need to be so connnected to my auctions, and to wow that I need to being doing my Auction Housing remotely. I can see benifit in being able to access guild chat, or battlenet chat if that feature becomes available. But is our gaming so economy driven that we need to be so connected to it to this extent to play. The social benefit, being connected , I can understand that – if that’s your thing, and while some of us may enjoy playing the auction house is your Ahing that much part of your wow experience you need to be so plugged in? Sure the $3 a month is maybe a minor cost ( unless your dollar is now 80 cents to the US dollar again. Fail !) but at this point, not something I shall use. It is however a little exciting, at what technology Blizzard is able, and willing to use to integrate with game. For the record, if you have a Mobile Battle.net Authenticator on your iPhone, the Armory app detects it, and asks if you want it to get the Authenticator code from that app — in other words, you don’t need to switch applications for your Authenticator code at all, the Armory app does that all for you. but I guess if you don’t have an authenticator then the option wouldn’t come up at all. I’m still reluctant to change to a iphone app authenticator. I think I am more likely to lose my phone then I am my dongle. My Husband has an Ipod Touch that he downloaded this onto and he has no other WoW apps on it. He has not had the same authenticator issues with the Ipod touch, he never had to enter his authenticator, granted he is not paying the subscription fee though he was able to create auctions. He was frustrated with not being able to log into the actual game while logged in on his Ipod, this means to auction house perusing while in raids or while far far away from a city…which would be awesome. Nice to read a review of the new function. I’m a part time player of the AH game and kinda hope that this function is hard enough to use that I don’t feel I need to get an iphone or stop being competitive on the market. I’ve read and been told, though I’m not sure if its official, that if your account gets hacked toons below level ten don’t get restored. I’ve made sure to level my bankers up just so that this couldn’t happen to me. oh, I hadn’t heard of that , most of my gold was being kept in the guild bank cause I heard that the log of money in the gold bank was easier to track and therefore restore 😛 I can’t imagine people who make massive amounts of auctions using it. It’s just not mass posting friendly. Single login for posting auctions as long as the app is open it seems. I love the app, nice to be able to stay on top on my auctions while at work. 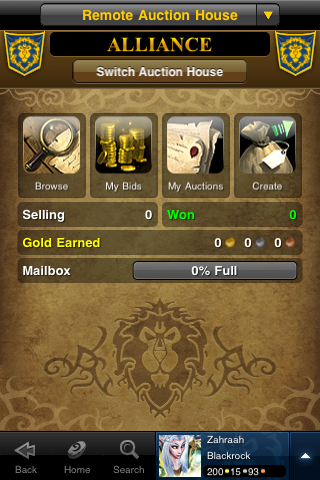 Even lets you claim your gold from your mailbox. And it is very easy to mass post. I post 50-80 enchanting scrolls every time I log on and use addons to cancel and repost them only if the auctions house prices meet certain criteria… but perhaps your idea of mass posting is on a different level. Yeah see I just can’t see me sitting through and posting 50-80 auctions using my Iphone, Now.. an Ipad – more room to move, maybe. I found a workaround to gain access to you bank alt (level 1) – as long as your in the Auction portion you can pull up any of your characters. I was able to pull up my bank toon only under the Auction screen not under the actual armory screen. And you have to click to the left of the avatar picture to make that the primary character. Hope that helps.